TIP 1: for the section requesting a “Certificate of Good Standing” from your home country of practice —> previous Australian Emergency Trainees have successfully used their “AHPRA medical registration certificate” as adequate proof. TIP 2: for the section requesting “2 reference letters” —> previous Australasian Emergency trainees have successfully used printouts of their last two Online Training Assessments (OTAs) from their last two DEMTs to fulfil this requirement. Please note that the email addresses listed on the PNG Medical Council website (namely: medical_board@health.gov.pg, info@medicalboard.gov.pg) do not seem to be working and give an automatic bounce-back email. 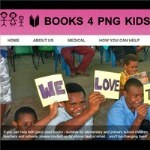 K3 (AUS$1.50) for Temporary Registration – if practicing up to 90 days in PNG. 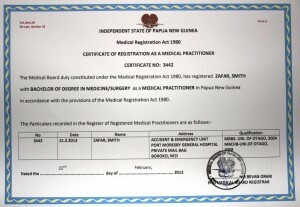 K20 (AUS$10) for Full Registration – if practicing medicine for >90 days in PNG. 5. Wait for anywhere between 7 weeks to 18 months for processing. 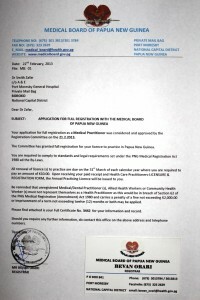 TIP: Another suggestion after gaining registration and finishing your time in PNG is to get a letter from your ED supervisor in PNG or a letter from the Medical Board (more difficult) that states you have not broken any laws in PNG or been charged with medical malpractice. 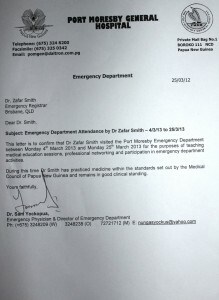 This will aid you in the future if you ever require written proof from PNG to give to another medical council. For example if you are applying for registration in Australia under AHPRA you will need written evidence from every country you have practiced medicine in stating that you have not had any legal proceedings against you for malpractice. Photographs & Videos on this website have been published with verbal consent from all patients / guardians.